You could say most dogs are able to swim by default and no intervention of human is required. While some dogs are excellent swimmers, others are afraid to, don’t like to, or can’t even if they like to (it’s not extraordinary to see a dog who tries to swim but sinks… not a common scene, however). The difficulty of teaching your dog to swim can vary drastically as it’s influenced by such factors as dog’s breed and personality. 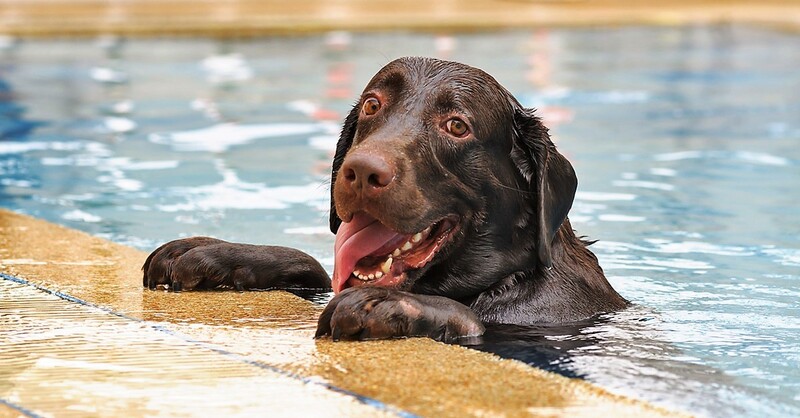 The first question might even be “why should I teach my dog to swim?” Firstly, you will avoid the risk of your dog getting into open and deep waters when unguarded. Second of all, we all know that swimming is a great way to cool yourself on hot summer days. The same applies for dogs and their thick furs. Therefore, it’s a very good skill to have health-wise, not just for fun. It’s also a solid physical exercise. Take it slow and remember – safety first! For the first lesson, choose a place that’s quiet and relaxing for the dog, especially, if the dog is stressed out about this activity. Also, do not choose deep waters even though you are going to be next to your companion at all times (NEVER leave your dog unattended in the water during the learning period). By no means – you mustn’t throw your dog into the water and expect it to learn to swim that way – that way you will most likely only discourage it or cause a serious trauma. Don’t force or rush it. Give it a time. Not all dogs are natural-born swimmers. If you are using a leash, don’t use it to drag your dog into the water – it’s for safety purposes only! It is important to teach the right technique. First of all, use a positive intonation when speaking and praise for good behavior (in this case, for getting into water, etc.). Technique-wise, offer your support under your dog’s midsection or hindquarters. That way, it will engage and urge to use its back legs as well (otherwise, the dog may over-engage its front legs only). It also a smart idea to get a solid dog life jacket, especially, if you are taking your four-legged friend to open waters or on a boat. The life jacket has to be appropriate for the individual’s body type, size, and weight. This is extremely important and therefore a good investment for breeds that are not naturally good swimmers, for instance, the Bulldogs. For very small breeds, it is recommended to start with a wading pool before introducing them to deeper (and moving) water. If your fella is very resistant, consider bringing some treats, such as snacks or toys, along. This will make the training session more relaxed and therefore pleasant for both of you. Even if your dog is a great swimmer and in good shape, do not let it unattended in open waters as it may keep swimming farther and farther, and, at some point, it can get too fatigued by which time it may be too late to return to shore. Because of this, it is also important to show your companion how and where to exit the water. Anyhow, if you do decide to go to public places and open waters, and to leave your dog unattended to relax and get a suntan or something, do make sure you provide it with a proper life jacket. This becomes increasingly significant when going offshore on a boat trip or something similar. As always, if you have any further questions, do not hesitate to contact us. You can also share your experiences here by leaving a comment. Previous articleDog eating Cat food – How to prevent it?